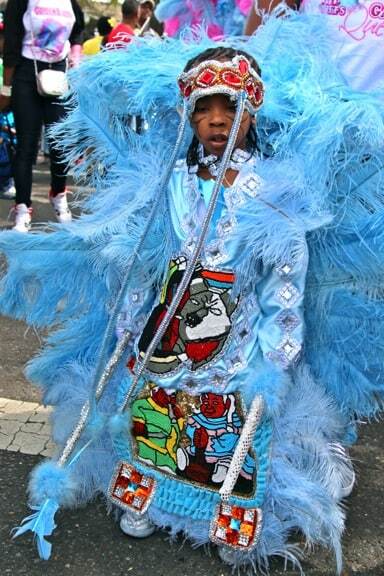 Like most people outside of New Orleans, we knew nothing about the cultural heritage of NOLA’s Mardi Gras Indians until we watched the HBO show Treme. 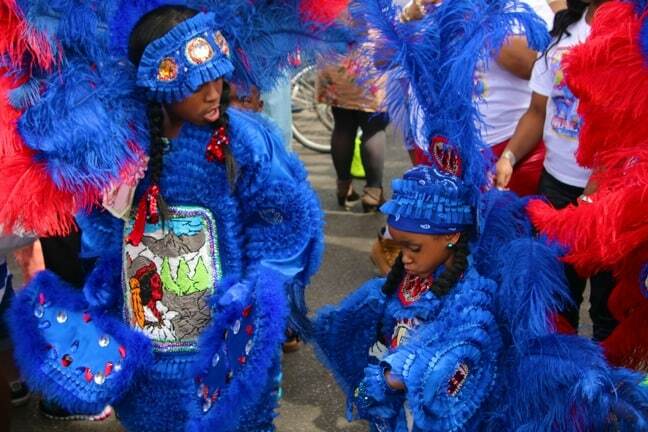 Created by David Simon and Eric Overmyer (The Wire), the show follows residents from the historic Tremé (pronounced Tre-may) neighborhood– a hodgepodge of musicians, chefs, community activists and Mardi Gras Indians– struggling to put their lives, homes and culture back together in the aftermath of Hurricane Katrina. Historically a racially mixed neighborhood, Tremé has long been populated by free people of color (even before and during the Civil War, thanks to the period of Spanish rule). Today, it remains the center of the city’s rich musical and culinary culture– the place where African-American and Créole traditions intersect. 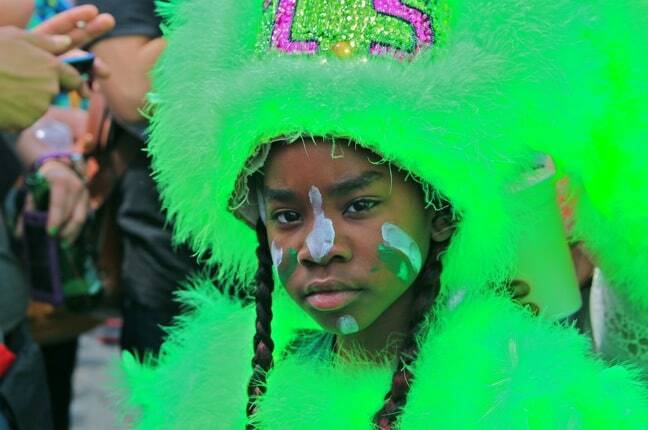 Jazz was born there, along with the traditions of Second Line brass bands and Mardi Gras Indians. Our favorite Treme characters were Albert Lambreaux and his son, Delmond, whose relationship was based on the true story of jazz saxophonist Donald Harrison, Jr. (a consultant and actor on the show) and his father. Albert is the “Big Chief” of the Guardians of the Flame tribe (which Donald Harrison, Sr. founded), who struggles to repair his home and the neighborhood bar where his tribe practices every Sunday while working to bring the displaced members back to the city. This includes Del, a successful trumpeter now living in New York. 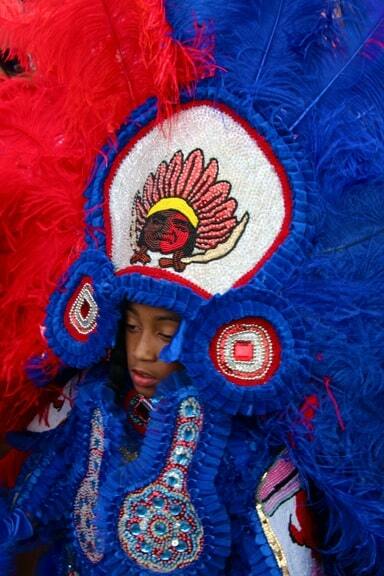 Diagnosed with cancer, Albert desperately wants his son to move back home, embrace his Mardi Gras Indian culture, and assume the role of Big Chief when Albert dies. 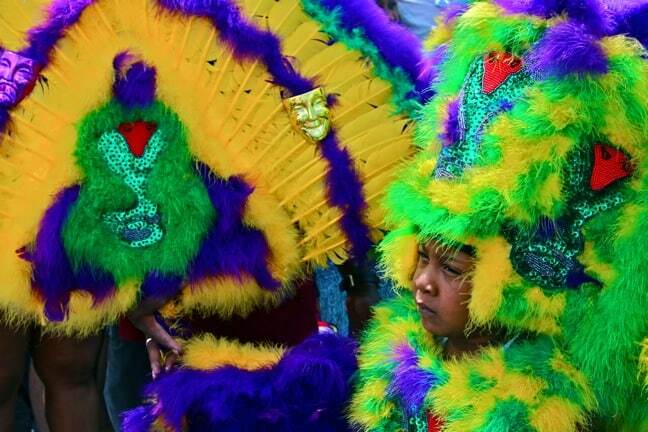 Their lives center around two things: Practicing ritualistic chants such as “Indian Red,” which descend from ancient African traditions; and sewing elaborate costumes (with hundreds of feathers and thousands of crystals) which they will wear only twice– once on Mardi Gras, and once on Super Sunday– before destroying them. Super Sunday is typically held on the third Sunday of March, in celebration of the Catholic holiday of St. Joseph’s Day. 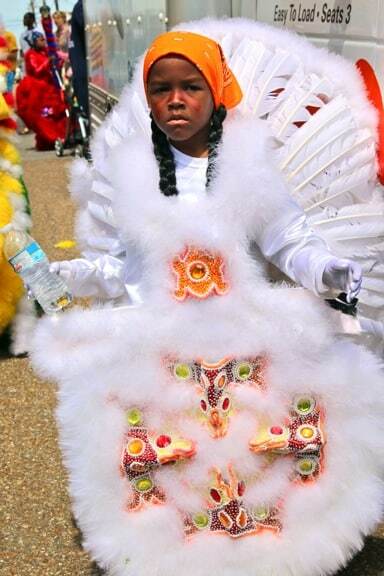 But because the Mardi Gras Indians put so much time, energy and money into their costumes (each one takes 9 months to a year to make, and costs upwards of $5000), and feathers do not look good when wet, they cancel the event anytime there’s a threat of rain. Luckily for us, Super Sunday 2014 was postponed until March 30, and we were delighted to be able to attend a cultural festival unlike anything we’d ever seen. A.L. Davis Park, in NOLA’s Central City district, was already swarming with people by the time we arrived, nearly two hours before the beginning of the Indian parade. Vendors were set up alongside the road, and the delicious scents of grilled meats, boiling crawfish, fried shrimp po boys and funnel cake vied for our appetite’s attention. There was an electricity in the air as everyone waited for the parade to start. 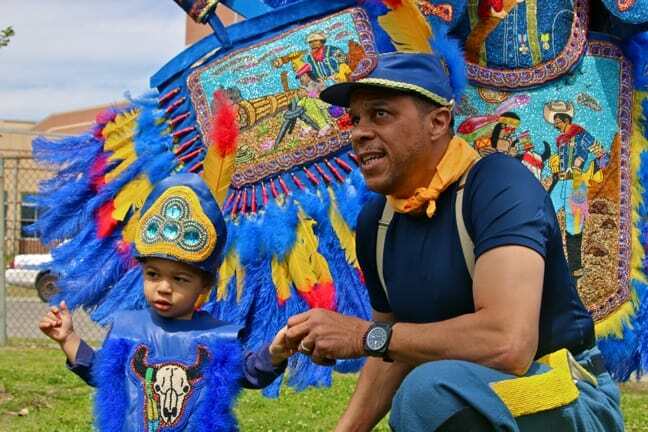 You could see the Mardi Gras Indians’ colorful costumes laid out at the corners of the park, most with Native American or African tribal themes in their remarkable beadwork. Some, like the one pictured at the top of this page, told stories, depicting the first encounter between the Buffalo Soldiers (black soldiers in the U.S. Cavalry in the late 1800s) and Native Americans. 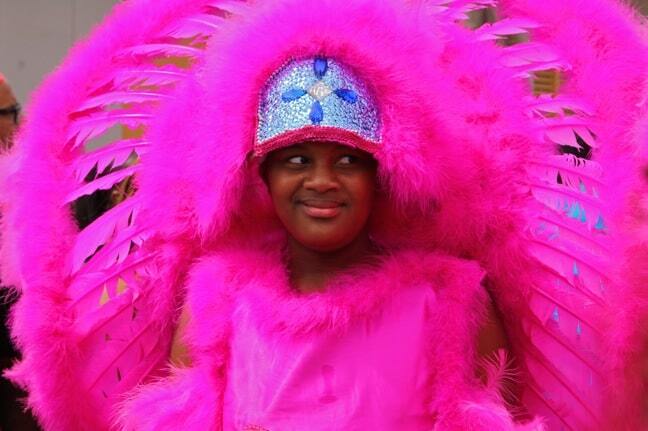 As I walked around with my 12-year-old daughter, marveling at the Mardi Gras Indians’ artful craftsmanship, what struck me the most was how much of a family affair Super Sunday was. Fathers and sons, mothers and daughters put on their matching costumes side by side. Nearly every “Big Chief,” the patriarchal leader of the tribe, was accompanied by his dancing “Queen.” Older sons occasionally served as “Spy Boys,” walking ahead of the tribe to clear a path through the thronged masses of people angling for a photo. Costumed kids ranged in age from around 2 years old to older teens, gamely trudging along behind their parents, strutting their stuff, and proudly showing off their costumes for the crowd. It was overwhelming and insane and altogether one of the most amazing cultural experiences I’ve ever had a chance to experience. 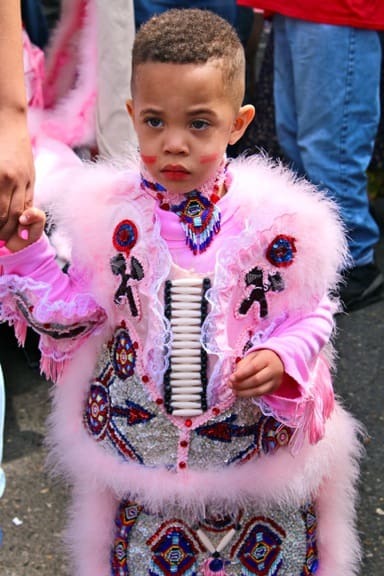 And it was all the more rewarding because my kiddo, Alex was right there by my side, moving quickly through huge crowds of people and jostling for position to get within a few feet of the Mardi Gras Indians. As a matter of fact, my not-so-little 12-year-old took more than 80% of the photos on this page! 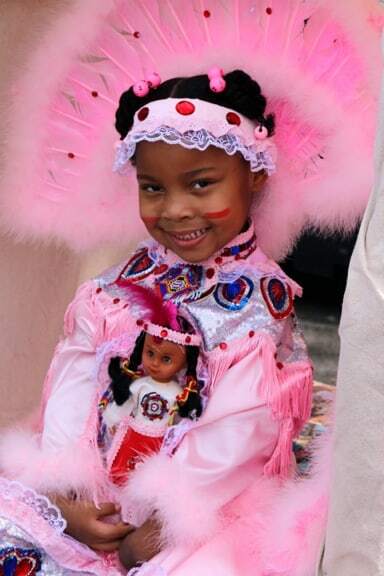 It seemed somehow appropriate that, as the Mardi Gras Indians passed down an African-American tradition that dates back to the mid-1800s, I was passing down my love of culture and photography to my child. 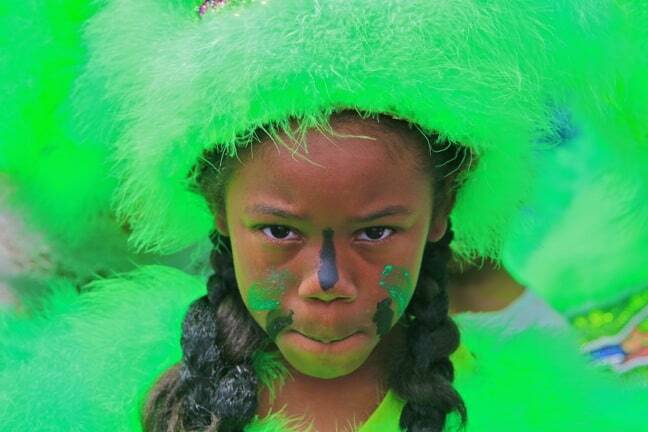 We’ll have a more in-depth story about the storied history of the Mardi Gras Indians coming soon (including an interview with Donald Harrison Jr.).